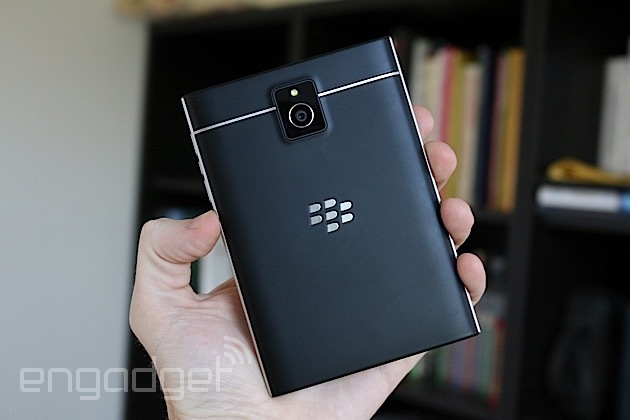 For the first time in ages, I'm intrigued by a BlackBerry device. That's rather unusual these days, but it wasn't always this way. 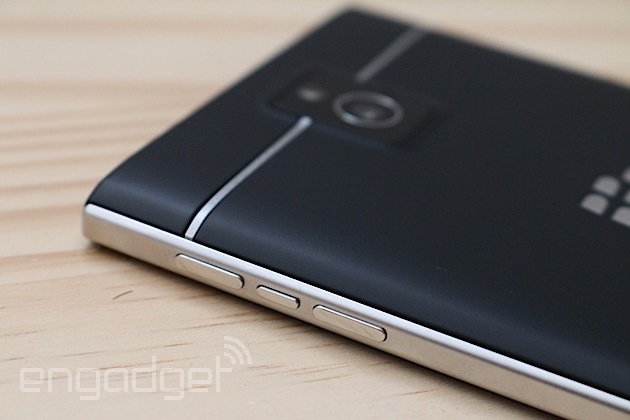 I remember when I first saw the Pearl eight years ago; it was one of the most beautiful devices I'd ever seen. The Curve and Bold series didn't disappoint either. But the magic has been missing from the Canadian phone maker for a long time, evidenced by its struggling sales. Only one in a hundred smartphone owners use a BlackBerry, and the company's older-generation hardware is still outselling current BlackBerry 10 handsets. Now it's putting much of its hope in a unique-looking squarish device called the Passport, which launches today in five countries (with 30 total by the end of the year). The $599 off-contract/$249 on-contract device ($699 in Canada and £529 in the UK, off-contract) is designed to appeal to fans of physical keyboards and large displays. It may not restore the magic BlackBerry's lost in recent years, but my initial experience with the Passport has been more positive than I expected. At least that's a start, right? Calling the Passport a square device isn't quite accurate, but it's pretty close: It features a 4.5-inch square LCD panel with a resolution of 1,440 x 1,440 pixels (for a pixel density of 453 ppi), with a squished keyboard underneath that doubles as a touch-sensitive trackpad. (More on this soon.) Instead of the phone prompting a love-at-first-sight reaction from the people I showed it to, most folks had a bewildered look on their faces, as if to say, "What is the point of this thing?" It's not hard to understand why. The smartphone is named after the booklet that allows international travelers to enter and exit countries, presumably because its dimensions are nearly identical; place a real passport on top of the Passport and you'll only see the outline of the device. It's 128mm tall and 9.3mm thick, and it's on the hefty side at 6.86 ounces (194g), but the 90.3mm width is the most striking part of the phone's hardware. To put it in perspective, it's wider than the 5.5-inch iPhone 6 Plus, the Galaxy Note 4 and the 6-inch Nokia Lumia 1520, and is only 1.9mm narrower than the 6.4-inch Sony Xperia Z Ultra. It's also just a tenth of a millimeter skinnier than the LG Optimus Vu, which sports a nearly identical shape, but without the keyboard. The crazy width on the Passport is no accident -- the designers made it this way on purpose. In fact, BlackBerry boasts that it's 30 percent wider than an average 5-inch device, and as a result you'll see 60 characters on a single line. In other words, the manufacturer expects you to do a lot of reading on the phone, whether it be emails, messages, websites or e-books. Naturally, the first thing I asked BlackBerry reps when shown the phone was how anyone will possibly be able to use the device one-handed. To the company's credit, the Passport feels very comfortable to hold with two hands, so anyone who misses the tactile feel of a physical keyboard will be right at home in this position. It was everything else -- the stuff that doesn't involve typing -- that I was concerned about. How am I supposed to use it in the subway? 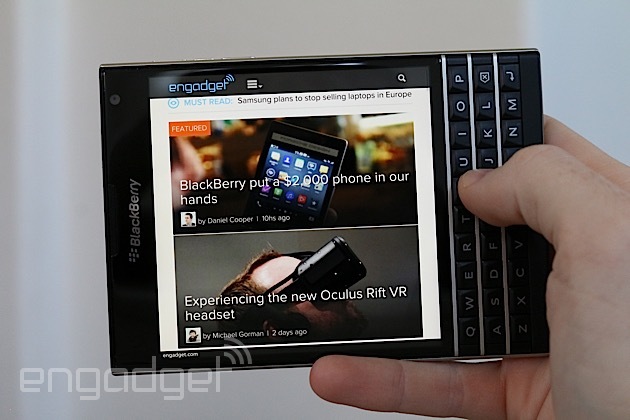 BlackBerry responded by rotating the phone into landscape mode. Landscape mode would normally seem silly on a square device with a physical keyboard, but the phone's engineers added a neat trick. 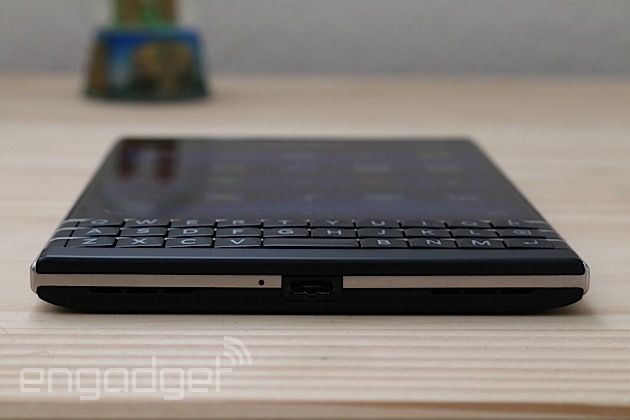 As briefly mentioned earlier, the three-row keyboard doubles as a trackpad, and this comes in handy in several ways. In landscape, it lets you scroll through websites, feeds and other content without having to reach onto the screen. (Sure, it doesn't feel quite as awkward to hold this way, as long as you prop the bottom of the phone up with your pinky finger.) It also adds gestures to your typing experience; three word predictions will pop up on a virtual bar at the bottom of the screen, and you can swipe up from below that word to choose it, which eliminates the need to stop what you're doing to tap on the screen. You can also swipe left to delete a full word and use the pad to move the cursor around. After a little bit of use, the keyboard actually feels more comfortable to use than I expected, but it definitely will require an adjustment period. I get thrown off anytime I have to switch from the tactile keyboard to tapping on the hard screen, and it's difficult to get used to the small space bar and lack of physical symbol or number keys. Still, it didn't take long before I found myself getting into a groove. 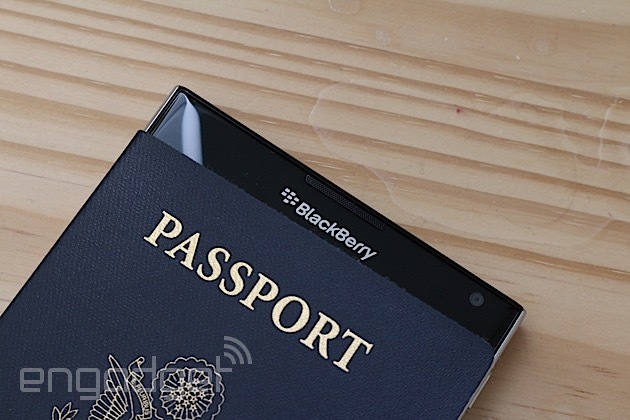 The Passport is the first BlackBerry device to come with OS 10.3. Among its list of features is Assistant, the platform's first attempt at a digital assistant like Siri, Cortana or Google Now. Long-press the middle button on the right side to activate the feature, which uses Nuance technology to process what you're trying to say. As you might expect, you can use Assistant to tackle tasks like calling and texting friends, sending emails, creating and editing appointments, checking in on Foursquare, playing music, getting navigation routes and sending social media updates. Additionally, the Passport comes with support for the Amazon Appstore, so users will have more app options (though still not as many as its competitors). Just as before, you'll still be able to sideload Android apps, as long as they are compatible with Android 4.3 or earlier; KitKat apps still aren't supported on BlackBerry's runtime. The company's also launching a service today called BlackBerry Blend, which is akin to the Continuity feature on iOS -- through an app on your computer or tablet, you can manage your phone's content, transfer files back and forth, send and receive texts/BBM messages and handle both your personal and secure work stuff. The service will be available as a free download on Mac OS X 10.7 and better, iOS 7 and higher, Windows 7-plus and Android 4.4 KitKat, but BlackBerry plans to launch extra enterprise features through subscription in the coming weeks. Once I got past its awkward facade, I noticed that it's actually very solidly built. Nothing on it feels cheap; it comes with a stainless steel frame along the sides, with a black, soft-touch plastic on the back that, along with the fret racing across the top half of the phone, gives it an elegant look and feel. The unlocked model retains the company's signature logo on the back, but nothing else. Surprisingly, the Passport packs a respectable spec sheet. It's powered by a 2.2GHz quad-core Snapdragon 800 chip and comes with 3GB of RAM, 32GB of internal storage (with microSDXC allowing up to 64GB of external space), a 13MP rear-facing camera with LED flash and optical image stabilization, dual-band WiFi with 802.11ac support, a four-microphone setup, NFC, Miracast and 10 LTE bands. And let's not forget the 3,450mAh battery, which is one of the top benefits of the phone's size. Unfortunately, it's not removable; the only part of the back you can take off is the top section, above the top fret. This section contains the nano-SIM and microSD slots. Overall, my first impressions of the Passport are better than I expected. The device is built well and the keyboard is comfortable, but be prepared for a few odd stares from those around you. That said, I have plenty of reservations: I'm not sold on BlackBerry's solution to the phone's one-handed dilemma, and although the app situation is better than it was a year ago, it's still not great. I have a unit that I'll be testing over the next week and will offer my thoughts in a full review.